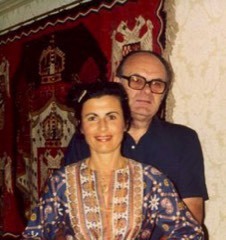 Ariane’s parents, Danica and Aleksandar Trifunovic who were born in the former Yugoslavia and are Serbian, immigrated to the United States and were married in Saint Sava Serbian Orthodox Church in northern Indiana. After they married, they settled in Wilmington, Delaware, where they first had their son Robert and then their daughter Ariane, and later moved to Philadelphia, Pennsylvania. It was there that Ariane was baptized and raised in Saint Nicholas Serbian Orthodox Church. This church subsequently moved to Elkins Park, Pennsylvania. Saint Nicholas Church received a special blessing when St. Nikolai Velimirović consecrated the grounds in 1951 during its sacred groundbreaking ceremony. Later, Ariane was also married to Anthony Montemuro in Saint Nicholas Serbian Orthodox Church and has two children, a son Tony and a daughter Ana. 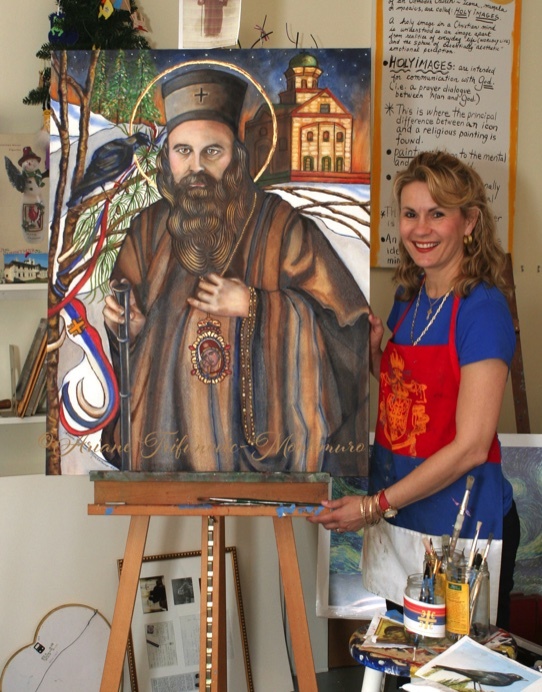 As a Serbian American artist, author and educator, Ariane is passionate about sharing her love of God and her Holy Orthodox Faith that her Serbian parents and ancestors preserved for her. Ariane was influenced by her early exposure to icons at home and in church. These icons, or sacred depictions, are used as a bridge to create a connection between oneself and God. Icon is a Greek-derived word from “eikona,” which means likeness, image or representation. Orthodoxy holds that these images are mystically connected endowments to that which they depict. They also celebrate through lines and colors, holiness, “dwelling of God within men” (Revelation 21:3). As an adult, she had the opportunity of taking several iconography classes from the world-renowned iconographers of the non-profit organization, Hexaemeron, and believes her oil paintings are strongly influenced by her love of Orthodox Christian iconography. Ariane holds a BA in Art History and a Masters in Teaching Museum Education; she also attended the New York School of Visuals Arts where she studied studio art for several years. She serves as a board member of The Decani Monastery Relief Fund, a humanitarian non-profit organization that rebuilds desecrated Serbian churches and monasteries and helps the forgotten people of Kosovo. Ariane hopes and prays that her book, “I Shall Remember Thy Holy Name from Generation to Generation” penned with fellow Orthodox Christian Tim Weeks and published in 2016, is a golden thread in the reader’s life, pulling him or her closer and binding them in their Creator. Her book is her offering to the God she loves with all her heart and her gift to her children and generations to follow, in hopes that they also preserve their Holy Orthodox Christian Faith. Having been so inspired by what she read in Ariane’s book, Francene Samaras Foster began a blog, Miracles of Our Orthodox Christian Wonderworking Saints, as a way to invite others to share their own personal miracle stories of the Saints of the Orthodox Christian Faith. Ariane contributes to it from time to time. As her friendship with Francene grew, they decided to begin a fellowship together, The Fellowship of Saint Matrona the Blind, with its mission being to educate and inspire individuals about the Orthodox Christian Faith. Francene and Ariane aim to fight spiritual blindness through knowledge of our Holy Saints via the written word, narrative artwork, and audio programming. Ariane and Francene are administrators and founders of the Fellowship. It is a pan-Orthodox Christian fellowship whose primary aim is educational outreach for lay individuals.